It’s probably too soon to be thinking about spring, but yesterday was a truly glorious day in Seattle — one that called out for a bike and, yes, a small dog. 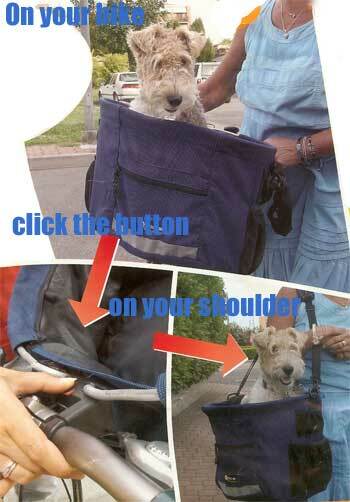 Last spring, I wrote a post about several bike carriers (and, alternatively, carrying your dog in a backpack carrier). One of the most intriguing carriers I found was the WalkyBasket, but I couldn’t find a supplier that would send one to the U.S. Now it’s available (I bought ours from Canine Concepts), and here’s what I think. The WalkyBasket is, relatively speaking, a large carrier (15.7Lx13Wx10H). That’s good news for me, because Chloe’s a big small dog. The carrier is made of a sturdy PVC fabric, and it’s nicely put together. It has several outer pockets, two of which will be occupied with the optional zip-in mesh top and the rain cover. Still, you’ll have room in the others for a water bottle and some treats and a leash. There is a tether to attach to your dog’s harness, and the bottom of the carrier is lightly-padded and removable for cleaning. The zip-in mesh top is presumably meant to keep your dog contained, but it’s very lightweight. The tether is a more reliable restraint. The rain cover, by contrast, is very sturdy — if it covers the carrier completely, it’s hard to see where your dog’s air would come from. Happily, you can adjust it so it leaves a section of the top open, like pushing a shower cap to one side of your head (consider carrying a couple of clothespins or binder clips to ensure that the cover stays on the carrier and doesn’t get popped off by its elastic). The WalkyBasket would, I think, be a good choice for someone who wants to travel somewhere else and then go biking. The sides of the carrier are unstructured, so the carrier collapses into a packable oval about 2″ deep. It comes with a shoulder strap, and once the carrier is unhooked from the bike, it functions well as an over-the-shoulder carrier. It mounts to a bicycle with a KLICKfix handlebar adapter, which is pretty easy to install (remember to bring a Phillips-head screwdriver with you). Please note that KLICKfix also makes an extender that attaches to your seat post; I prefer to have my dog in front of me on a bike, but the extender might be a good option if you need to carry two dogs. Why are there such cute options for small dogs! I would need a sturdy wagon train attached to the back of a moped to take our dogs out for a ride! I hear you — I feel the same way (but one step down) about the wide range of attractive choices for REALLY small dogs. Being a big small dog, Chloe always has, say, one good choice of bike carrier — but tiny dogs have tons of options. obviously getting spring fever here! I’m liking this WalkyBasket, so I’d go with that (though my blogging side sez buy different ones and report on them!). And send pictures!! !